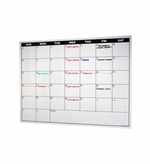 OptiPrint™ dry erase calendar decals with a convenient peel-n-stick backing and a removable adhesive that applies directly to your wall or any smooth surface. 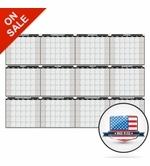 A full line of calendar decals to fit whatever your needs may be. The adhesive on the decal is removable so you won't destroy your wall when you decide to take it down. 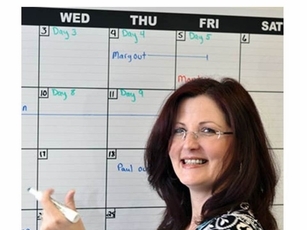 Each option comes with our exclusive dry erase writing surface and with proper care you should have a great dry erase planning calendar for years to come. 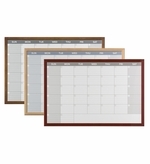 Select from one month to one year calendars in a variety of options. 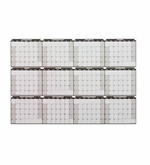 A very contemporary and super flat design lets you have a great, super large dry erase calendar that can mount to any smooth painted surface without that industrial looking marker tray and trim. On top of that all of our dry erase calendar decals can ship to you by UPS. They're all rolled up in a heavy-duty cardboard shipping tube so when they arrive you won't need to find extra help to carry it upstairs or into your office. All printed and made in the U.S.A.